From all accounts of what Hacking Team has been up to, it seems there's some cyber-karma at play here because they got pwned. Anyway, I'm modifying the phrase "Live by the sword, die by the sword" (which is apparently attributable to Jesus?!) 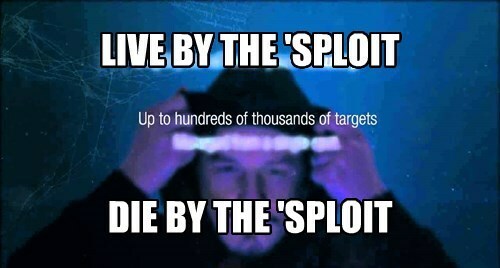 and swapping in a hacker abbreviation for the word "exploit". I figure it's an apt evolution of the phrase for the 21st century, and most likely an accurate prediction of what's in store for Hacking Team because I doubt they'll be doing much business after their entire nefarious business became public domain.